Saint Peter’s Basilica altar choir stalls, Vatican City, Sacred Music and Arts Festival Mass. She is a member of Nollaig na mBan NYC, an Irish Women’s group that celebrates Irish culture while raising awareness and funds for The Dwelling Place NYC, thedwellingplaceofny.org/ a transitional residence for homeless women at 409 West 40th Street, New York City. Dolores has been a board member of the United Nation’s Development Fund for Women/UNIFEM,NYC and Atrevete Flamenco Dance Theatre of New York. She is a volunteer for the Broadcasters' Foundation of America, Catholic Charities of the Archdiocese of New York and Saint Patrick's Cathedral Choir music ministry. When I'm Not In The Office I can be found... at choir rehearsal or choir liturgy at Saint Patrick's Cathedral, Fifth Avenue, New York City. People would be surprised to know that I... am a licensed Sightseeing Guide for the City of New York specializing in Catholic shrines, saints www.SaintsOfNewYork.com and churches. Favorite all time vacation... That's a tough one since I love to travel and always love to visit my family at “home” in Ireland. 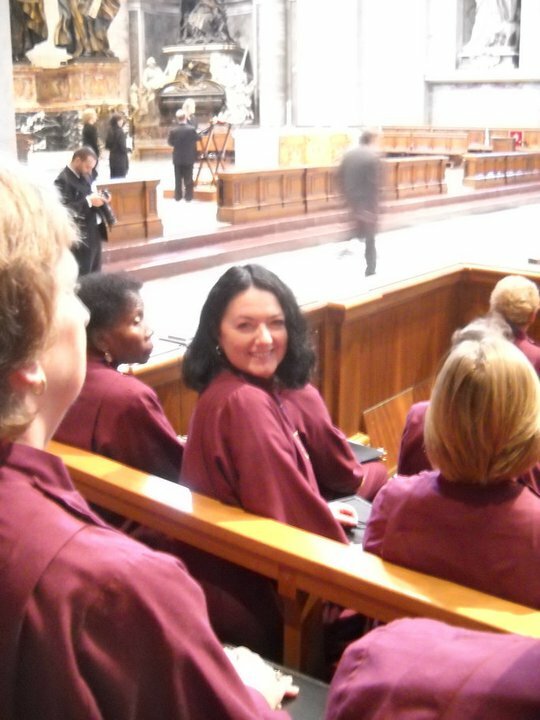 But, the October 2010 St. Patrick’s Cathedral choir trip to Rome and Vatican City to open the Sacred Music and Arts Festival with a pilgrimage to Assisi was a once-in-a-lifetime experience.